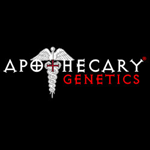 The Apothecary Genetics company started growing in the early 90\'s and soon became one of the leading and most renowned breeders. Originally from Northern California, these pioneers created Grape Ape (aka GDP), Old School Jams, KAIA Kush, 3-D, and Sour Grapes!! In 2009, they moved to Southern California and continue to produce the amazing.